An old double mirror brought from Constantinople; a young girl standing in front of it, looking at the two different images that are reflected. One is roundish and plumpy like a Renaissance painting; the other tall and stylish like a fashion model. The first one is actual and real, the other one a deception, a shadow, a ghost perhaps, disappearing into the light. The memory of the grandmother from Constantinople; her embrace is big enough to comfort and soothen the sorrows of the whole world; the reflection of the granddaughter who doesn’t want to resemble her because her mother thinks it’s a shame. A modern coming-of-age novel, at a time when families and young adults are pushed to their limits, both physically and ethically. The economic crisis, and the way it affects interpersonal relationships, is one more issue Eleni Dikaiou addresses and has chosen not to ignore. In her book «Wind Blowing in Her Hair,” she communicates to her audiences ways in which the younger generation may cope and react in times of crisis. . In her new young adult novel, the economic crisis is again the focal point, along with other issues such as, generation gaps, the stressful attention on fashion, relationship disappointments, teenage pregnancy, and the freedom to make life-changing decisions. […] The novel has one main character. Nevertheless, I consider it a multi-character story. Grandparents, parents, siblings, classmates from grade school to high school, family relationships, casual and committed friendships or relations, all have a meaning of existence. […] A clean and well rounded young adult novel – yes, Eleni Dikaiou once again (and steadily) proves that she can interact with teenagers...by being bold (with caution) and without provoking...by being rebellious, yet, without offending the morals of others, or her own. The author attempts to close the circle and to complete the dialogue she opened in her previous book Wind Blowing in her hair by illuminating the motives and choices of two young people who are called upon to manage problems related to their own internal world, their family and social environment, as well as the moral and economic crisis. The later, undoubtedly, is the canvas on which she designs her plot. […] Reflections in a Double Mirror may not offer ready-made solutions, but provides food for thought and personal judgment. The end is not a happy one, and how could it be when the heroes still "bleed" from their choices? Nevertheless, hope is not lost, a proof that a good realistic YA novel can reconcile reality with the optimism we all need. It is therefore worthwhile to be read by teens and adults, to be discussed and interpreted on multiple levels. 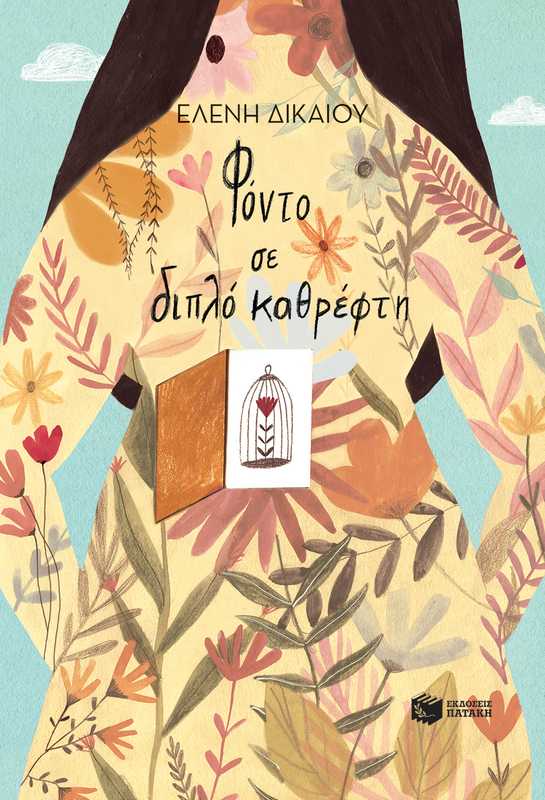 Reading the latest novel by Eleni Dikaiou, I was not only pleased with her pure literature but also with her boldness of touching a very serious social issue. The problem that many young people, especially girls, face in their teens about their overweight.